To our profound sorrow, a new threat to the Church of Christ has arisen in connection with the pretensions to global jurisdiction of the Hierarchy of the Constantinople Patriarchate. 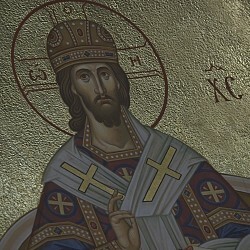 The Patriarch of Constantinople and his supporters now reject the commonly-accepted concept held by the Orthodox Church of its status with regard to relations to other Local Churches as “first among equals,” attempting to demonstrate that his position must be seen as “first without equals.” Based on this erroneous and anti-canonical concept, the Patriarch of Constantinople deems it possible to intervene in the internal life of any of the Local Orthodox Chuches, violating the principle of sobornost’ [collegiality] which has guided the Church since Apostolic times. Unfortunately, the present claims by the Constantinople Patriarch on the territory of the Ukrainian Orthodox Church are not the first example of the violation by Constantinople of the unity and sobornost’ of the Orthodox Church. As early as 1923, the Constantinople Patriarchate unilaterally rent asunder the unity of Orthodox Christians with the introduction of the so-called “new calendar,” which upset joint prayer and the Liturgical life of the Church. The Russian Church Abroad especially poignantly grieves over current events in the Ukrainian land, considering her historical genesis from the Provisional Supreme Ecclesiastical Administration in the south of Russia. Taking part in a Council of Bishops of the future Russian Church Abroad, which took place on November 6/19, 1920, on board the vessel “Grand Duke Alexei Mikhailovich,” were Metropolitan Anthony (Khrapovitsky) of Kiev, Metropolitan Platon (Rozhdestvensky) of Odessa, Archbishop Feofan (Bystrov) of Poltava and Bishop Veniamin (Fedchenkov) of Sevastopol, who held sees in the territory of today’s Ukrainian Orthodox Church. Additionally, among the eminent hierarchs of the Russian Orthodox Church Outside of Russia were many who were closely bound with the Ukrainian lands: the respected head of the publishing brotherhood of Pochaev Lavra, Archbishop Vitaly (Maximenko), who continued his missionary work abroad; and St John (Maximovich), who shared the name of his great ancestor, Metropolitan John the Miracle-worker of Tobolsk, who was born in the Kharkov region and graduated from the Poltava Cadet Corps and Kharkov University, together with many other renowned archpastors. Grieving profoundly for the Ukrainian Orthodox Church and her much-suffering people, we cannot help but remember the words of the Apostle: “Whether one member suffer, all the members suffer with it” (1 Corinthians 12:26). 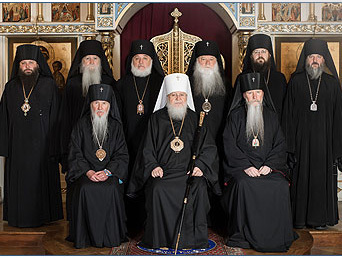 Considering the sorrowful events connected with the Patriarchate of Constantinople, which have taken place with the aid of the powers of this world, the Synod of Bishops declares its full support for His Beatitude Metropolitan Onouphry of Kiev and All Ukraine, the archpastors, pastors and flock of the Ukrainian Orthodox Church, and expresses its agreement with all the decisions of her Council of Bishops of November of this year. Praying fervently before the Kursk-Root Icon of the Mother of God, we fraternally join ourselves to the collegial prayers of the canonical Church of Ukraine for her Primate, who this year humbly marks the 28th anniversary of his archpastoral service, earnestly wishing His Beatitude firm health, boldness of spirit and the all-powerful aid of God. The faithful of the Russian Church Abroad are disturbed not only by the aforementioned events, but with the continuing internecine war in which Orthodox Christians on both sides of the conflict dividing Ukraine are dying. Also, military actions continue in Syria and other parts of the world, and the news is replete with reports of terrible natural disasters, fires, hurricanes, floods and earthquakes which threaten thousands of human lives and leave many homeless. We must combine our fervent prayers for all the dead, the victims and their relatives with assistance to our neighbors to the best of our ability. Let us remember that the Lord warned us about how we must regard calamities that befall us, saying: “Let not your heart be troubled, neither let it be afraid” (John 14:27). For “God is with us!” And if a person not only believes in God but trusts the Right Hand of the Almighty, and in His guidance, then he will always be at peace. We invoke upon all of you Divine blessings in these days which are leading us to the celebration of the Nativity of Christ. Vice President of the Synod of Bishops. Bishop of Richmond and Western Europe. Bishop of Seattle, Vicar of the Western American Diocese. Vicar of the Diocese of Australia and New Zealand. Vicar of the Eastern American Diocese. Feast day of the Kursk-Root Icon of the Mother of God "of the Sign"